Dipiscan is a professional network scanner, fast, capable, and with a huge number of configuration options. The package is easy enough for anyone to use. Launch it, click Analyze to scan your current network (no need to enter an IP address range, it figures out sensible defaults for itself), and the process is completed within seconds. A table displays details on every detected network device: reply time, NetBIOS name, DNS name, domain and user, MAC address, adapter manufacturer, and maybe the operating system, device description, available shares and more. Selecting and right-clicking any or all of the devices gives options to copy some or all of the report information to the clipboard. There are further right-click options to open an IP in Explorer, use Wake On Lan or Wake On Internet to wake it up, or control and access the computer in various ways (sleep or restart it, send a message, access it with Remote Desktop). Dipiscan can search for systems by IP or DNS names, run traceroute operations, or save specific systems to a "Followed Machine" tab for speedy access later. This would be useful enough all on its own, but Dipiscan really gets interesting when you hit Options > Configuration. You’re able to define basic rules for the scan: how many pings to use, how many threads, alternatives to use if there’s no reply (you can have the program check a port instead), set individual timeouts for ping, NetBIOS and WMI checks. Dipiscan exposes the methods it uses to retrieve user accounts (NetBIOS), MAC addresses (NBTSTAT then ARP), OS version (API), shares (API), and enables doing something else. You could decide to retrieve shares by API and WMI, for instance, or WMI alone, or not bother to check them at all. The program doesn’t have to work with the credentials of the current account. You’re able to set up specific account details to access remote stations or Active Directory, allowing you to successfully run Dipiscan on a USB key from multiple computers. Many of Dipiscan’s right-click options can be modified. For example, selecting "Open in Explorer" actually runs the command "http://%ip%". You could easily replace that to run any standard Windows command or third-party browser, file manager or anything else you like. Even the report table is more configurable than you’d expect. The program doesn’t just allow removing unwanted columns; you can add new ones, just as long as you can define the Registry, SNMP or WMI source. Dipiscan works well as a port scanner, but it’s the expert-level customization options that really help it stand out. Go take a look. 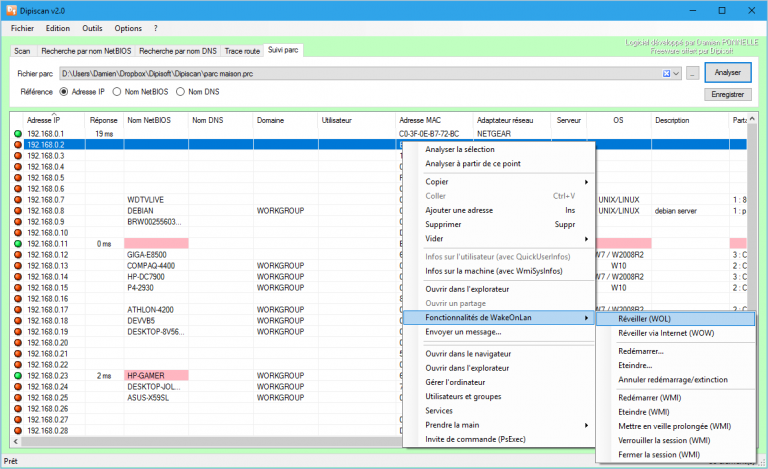 Dipiscan is available for Windows 7 and later.